New drivers from Callaway Golf and we have all of the info right here on the Home Page. For my first review I'm going to focus on the basics of the club, and I'll dive in and explore all aspects in deeper detail over time. I encourage and look forward to any and all questions you guys may have, so let em rip! 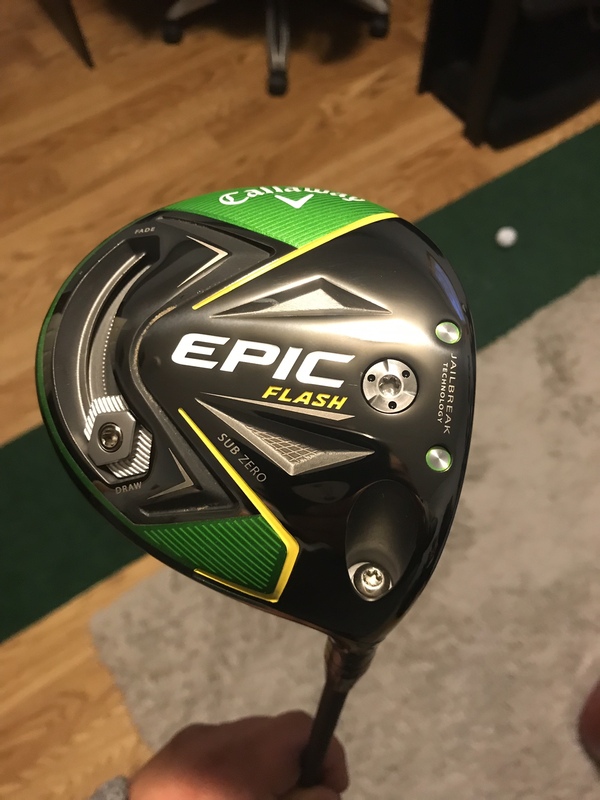 Prior to Epic Flash I have been playing the original Epic driver so I should be able to help with anyone who is curious how the two compare. There are 2 Epic Flash driver heads available, the Sub Zero head and the Regular (for lack of a better word?) head. I have the regular head and that one will be the basis for my review. I'm going to keep this brief because I'm sure the official material from Callaway is going to give you guys all you can handle here. Basically the face is the story here. 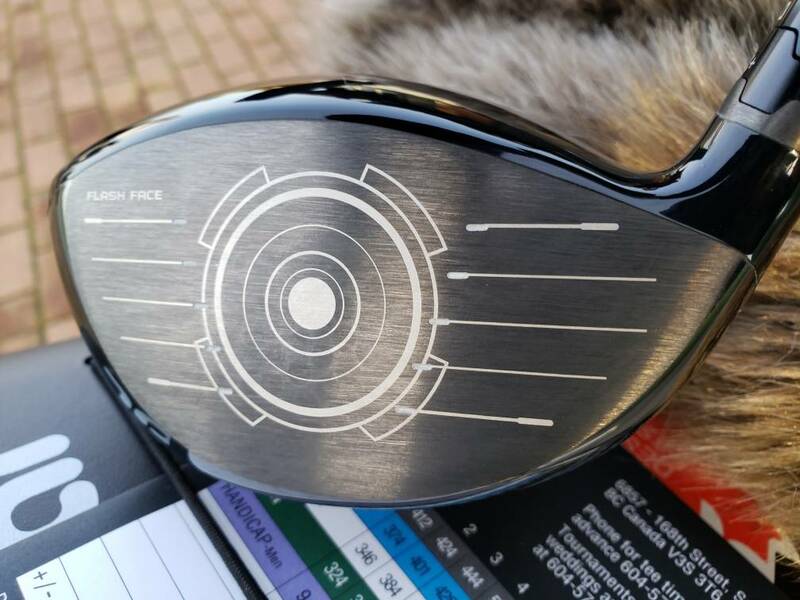 Jailbreak, the Adjustable Perimeter Weighting, and the Optifit hosel technologies all make a return, but the Flash face is what this driver is all about. 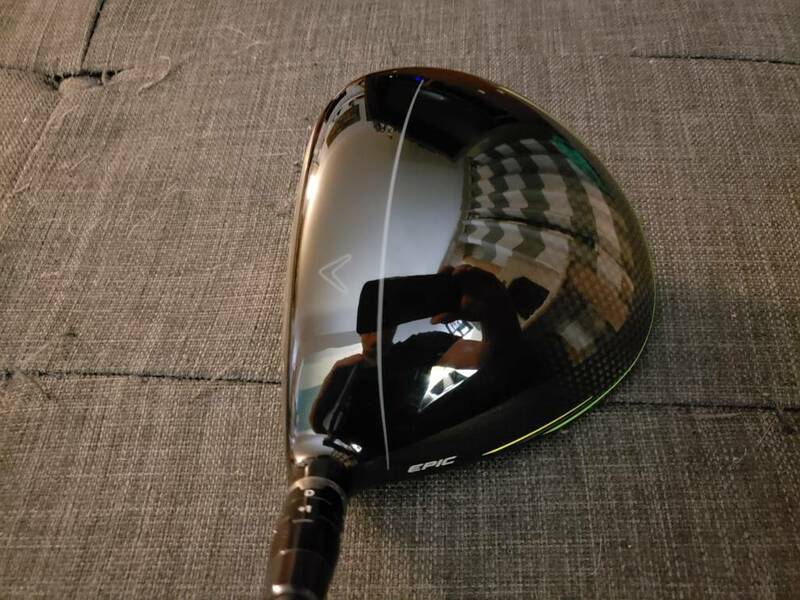 Basically Callaway used a super-computer to run thousands and thousands of different configurations for the face shape and thicknesses - something which would have taken humans with regular computers many many years - in order to find the exact optimum face for this specific driver head. The result is a face that looks completely unlike anything that's ever been done before by any company. It looks completely random with it's bumps and ridges, and I remember being surprised that the center was one of the thinner parts. The cutaways we saw at Callaway HQ were really cool. The first thing to notice about the Epic Flash is the green and yellow paint scheme. It's bold, and it's two colors that everybody will associate with something else - be it the GB Packers or The Masters. Personally I don't love the color scheme but I don't hate it either. If the goal was to be bold and easily noticed, the mission accomplished! Whether or not you enjoy the colors chosen I'm happy that the overall quality of finish is as good as I've seen. There are no blurry paint edges or anything that makes the driver look incomplete or lazy. The APW at the back of the Epic Flash has been refreshed and looks really sharp. The weight itself is a hexagonal shape and when pushed to the heel or toe limits has a really nice fit and finish with the track that hosts it. 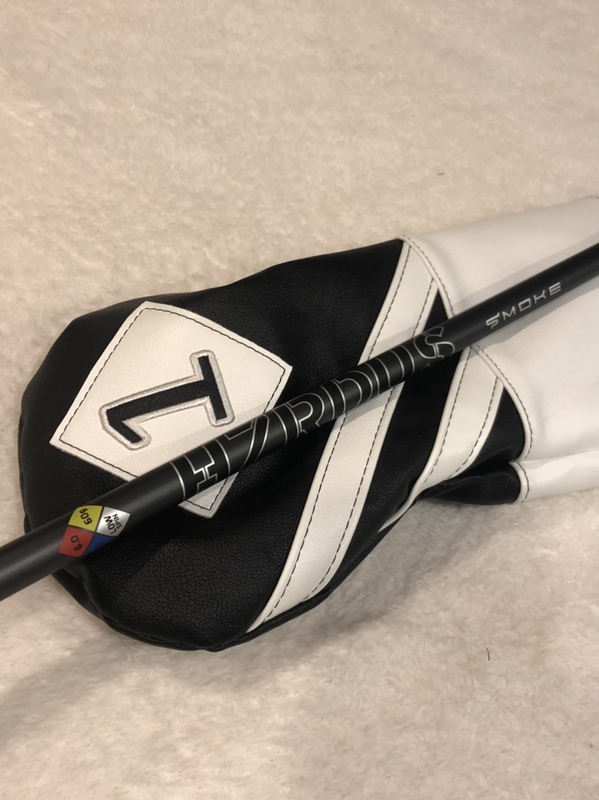 Looking at the crown, the first thing you'll notice is that Callaway has added a thin grey line from heel to toe about an inch back from the leading edge. This line follows the contour of the leading edge and is noticeable enough if you want to see it, and faint enough if you don't want to see it. For me, the addition of this line is MOST welcome and it helps me align the face with my stance and target line at address exactly how I want it. 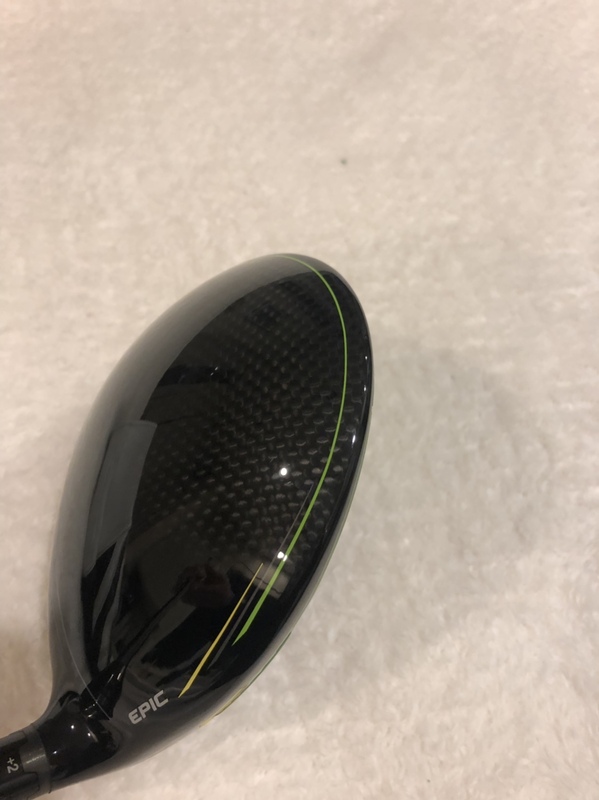 Moving on, the crown has the same carbon fiber fade that the previous Callaway models have displayed, although it's slightly different this time around and the carbon fiber look doesn't get as close to the leading edge before fading to black. 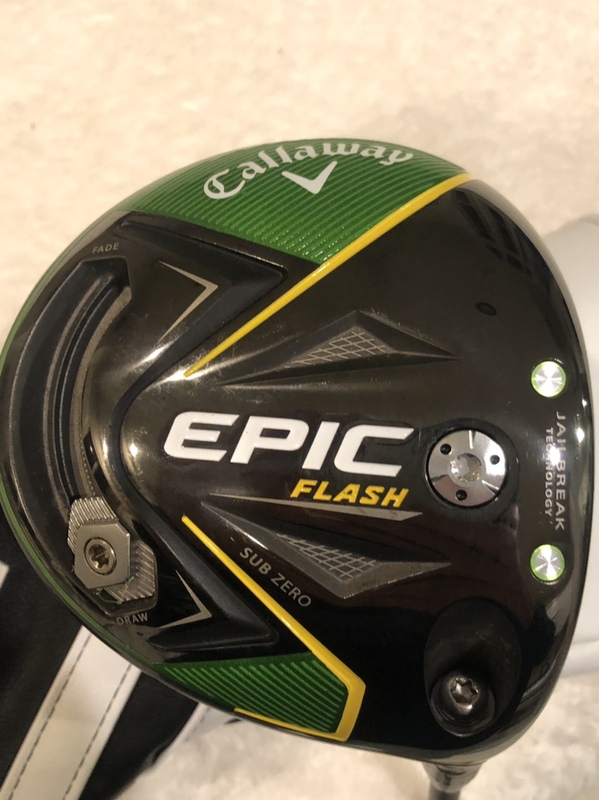 There is a green line around the rear just like on the original Epic driver, and this time there are two yellow accents at the heel and toe sides to frame the ball even further. Like I alluded to earlier, the face has some interesting graphics on the regular Epic Flash driver. It features large round circle in the center with a bit of a 'target' look to it, and then scoring lines working out to the perimeter from there. I have the Epic Flash 10.5, with the hosel set to "N -1" and at address the head appears to set up completely square to my eye. 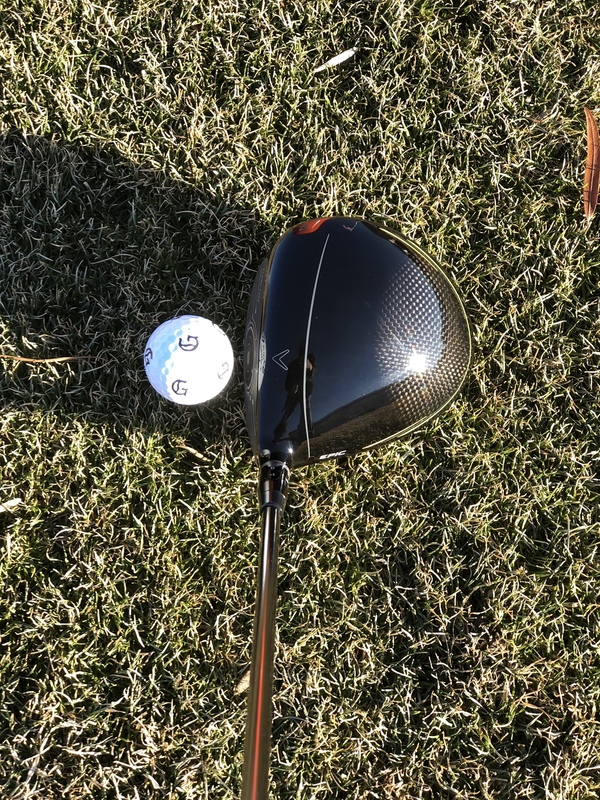 The overall head shape is a little bit shallower and longer than Epic, but not as long as Rogue, and still maintains a mostly round trailing edge. The speed steps which have been a feature on the crowns of Callaway drivers for a number of years are gone this go round. While they have not been replaced by any specific feature, their existence became redundant when the entire overall aero package of the Epic Flash was improved. I think this will be a talking point with this driver because it's a pretty big departure from the dull, boring thuds of composite drivers in the past. The Epic Flash is not afraid to speak it's mind at impact and greets you with an explosive sound which right away reminded me of some older more classic drivers. There's a wide spectrum of sounds that come from different corners of the face, with some large misses actually getting pretty darn loud. 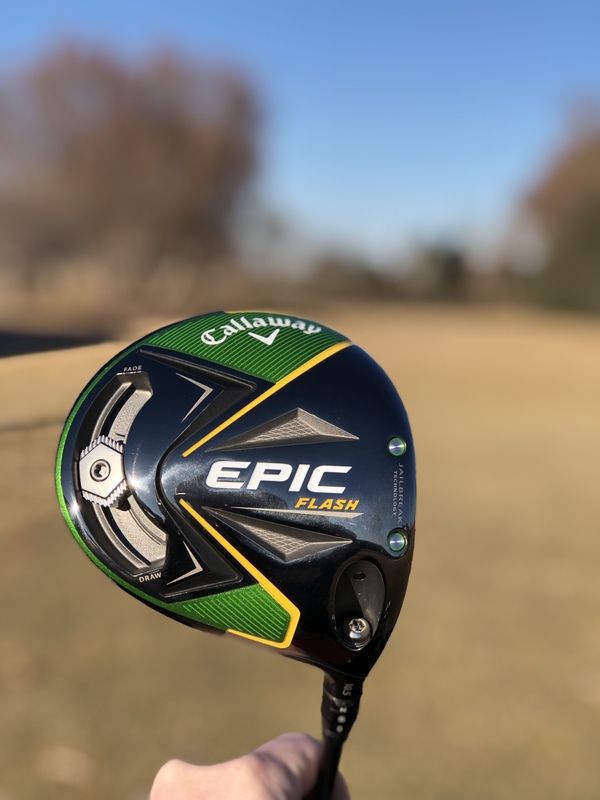 One of my main criticisms of the original Epic driver was the dull sound and the fact that no matter where on the face I hit the ball, it sounds the same. I am happy to report that is no longer the case here and while the sounds may not always be 'nice', they are effective at telling you where you've strayed. The feedback on center strikes is as good as I've ever felt with a perfect mix of "pleasant sound" and "BOOM!". I've so far found it incredibly rewarding and brings the enjoyment of hitting middle to an entirely new plateau. 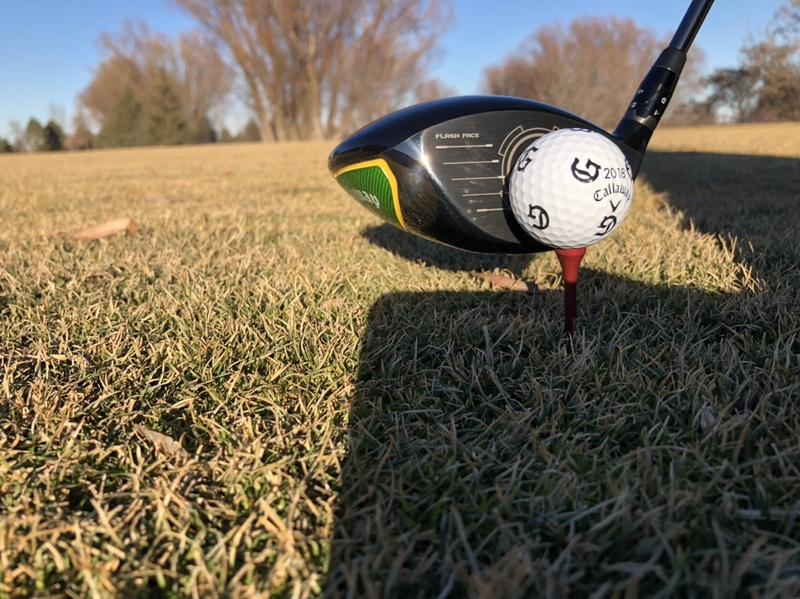 To me, the face has a nice firm feel and rather than feel like the ball is squishing into the face, it feels more like the ball wants nothing to do with the face and is gone instantly. I'm still confirming this next part, but I'm convinced that the sound changes quite drastically as the APW is moved around the track. I have the APW weight all the way in the heel and for me it definitely makes the head a bit quieter than with the weight in the center. As always with subjective topics like sound/feel - your mileage may vary. I'd love to hear what any of you guys think when you hit one! Many of you have probably seen the Callaway teaser for the Flash driver. 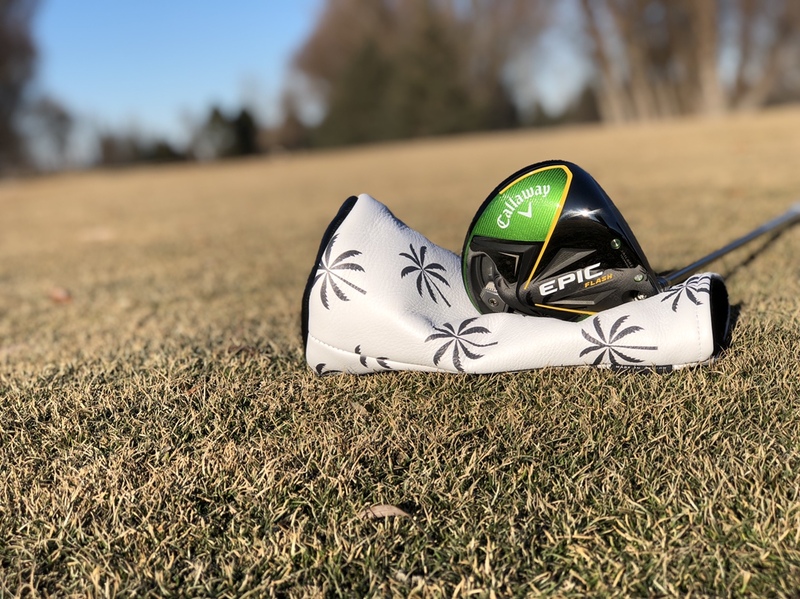 You probably focused on the green and yellow colors, or the carefully teased looks at the club face or maybe even the playful graphics which showed moving yellow lines. What most of you probably missed was the caption and its meaning: “Faster Than Humanly Possible.” Let’s explore that part more carefully. Callaway employed the use of a super computer with Artificial Intelligence (AI) to design the Flash line of drivers and fairway woods. I’ll be honest, when I first heard this I had flashbacks to the first Terminator movie and a bit of a feeling that maybe this was going to be a marketing driven release. I could not have been more wrong. Consider that during a typical release Callaway runs through a small-ish number of prototypes. For the sake of argument and confidentiality, let’s say less than 25. By using the super computer with AI they were able to generate over 15,000 prototypes. Now let’s pause to think about what a prototype is: the manifestation of design concepts to validate performance. It is an opportunity to learn which parts of a design work, which ones don’t and to improve upon that design until we reach a final product. 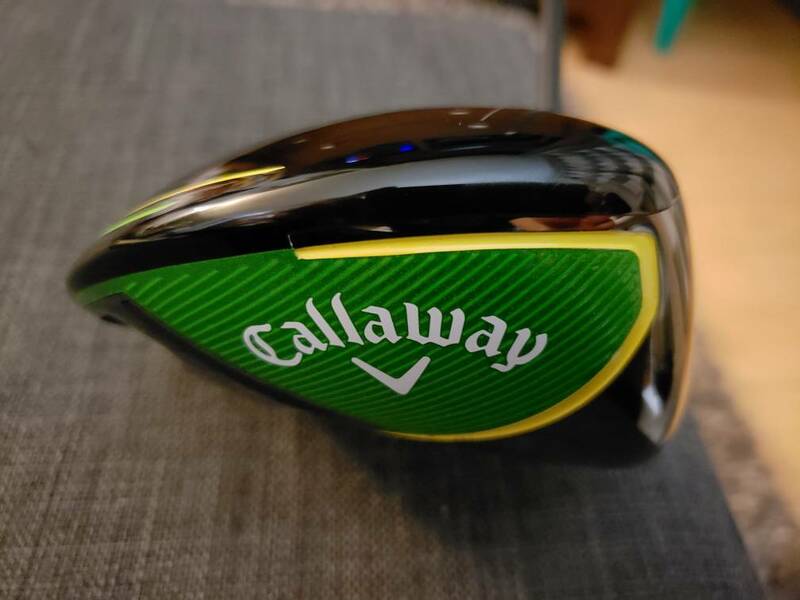 By using the super computer and AI Callaway was able to exponentially spike the learning and improvement curve during the design of this driver: 30,000 iterations of improvements instead of less than 25. But beyond the volume of prototypes Callaway was able to produce, using the AI super computer allowed Callaway to approach the design of this driver from an outside the box perspective. The process started by removing the traditional design parameters or constraints that Engineers are taught and conditioned to start with. The super computer did not start with those constraints. In this way, the “Fast Than Humanly Possible” tag line is literally correct. This was such an outside the box approach to developing a driver that it is literally true to say no human engineer would have EVER come up with this design. 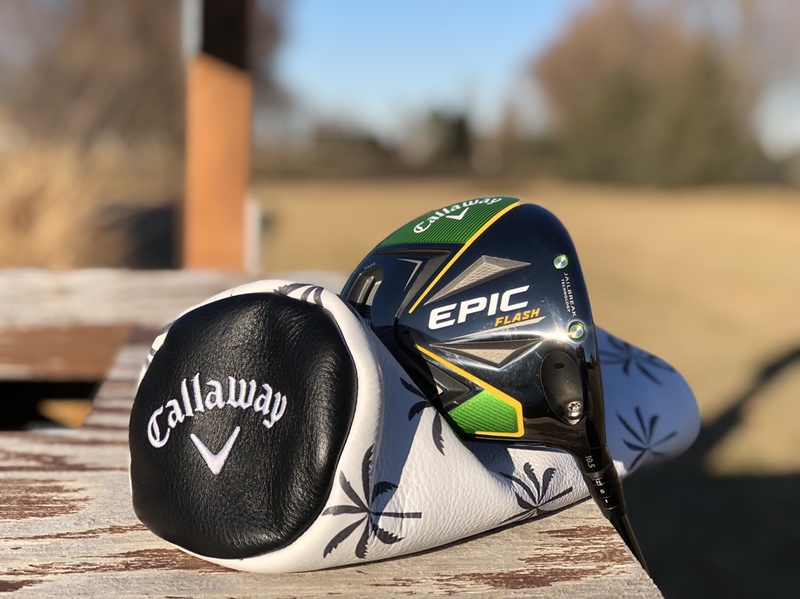 So what did Callaway come up with? You have seen the picture of the back of the face elsewhere in this thread. Look at it again. Notice how it is irregular and seemingly haphazard, with thick and thin sections next to each other in unpredictable ways. The back of a typical Callaway driver face is flat and smooth, but for two regularly placed raised lines that look like an X on its side. How does this happen? Callaway engineers input parameters in place and told the super computer to build. The super computer designed a prototype. Callaway engineers tested the prototype then adjusted the instructions given to the super computer. Because it has AI the super computer learned and evolved as it developed new and improved prototypes. Repeat 15,000 times. Now maybe – just maybe – some of you are still dismissive. “So what, the back of the face has some funny lines. Whatever, just throw that face onto every Callaway driver body and let’s call it a day.” Nope. The face is one part of an overall integrated design, it ONLY works with the Flash body. Callaway discussed what those other unique elements were but honestly, I’m not sure I could explain it again to anyone else. But suffice to say, this driver borrows from a familiar line…it’s not just a pretty face. Before heading to the Grandaddy my diver swing speed was regularly measured at 93-94 mph. My highest was 94.6 mph. At my lesson last Sunday my swing speed was regularly measured at 99-100mph with a peak speed of 101.4. This was in the exact same bay and on the exact same TM machine I’ve been on before. I asked and they confirmed they have not touched the machines or the software. 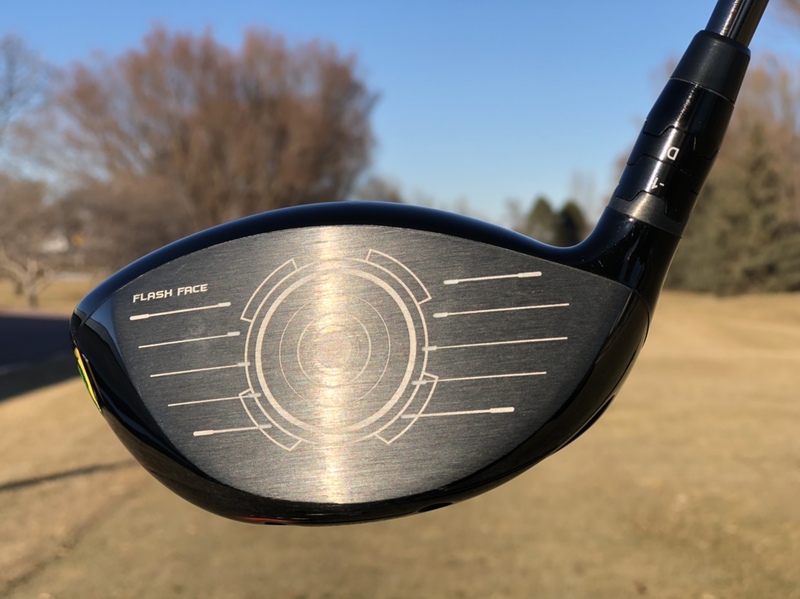 I asked and Callaway confirms the Flash driver was designed for added aerodynamics, but nothing that should account for this much SS improvement. New shaft? I don’t know. Human variation? I don’t know (except to say I have not seen triple digits in a long while). TM variation? Possible. Benefits of a fitted club? I don’t know. It makes no sense but it is absolutely what happened. I will keep an eye on this and report back. I have had handful of instances where I caught the ball flush with this driver. Each time the temperature was between 35* and 48*…in other words it was cold winter weather. Each time I was on a course I have played a million times. Each time I reached my good summer drive location. Per Trackman my optimal distances are now 245-250 carry and 275 total distance. My unofficially measured total distances with the Rogue were in the 245-250 range. If all of this was just the Trackman machine I would be extremely suspicious. Heck, I’m still suspicious. But there are those winter balls on soft wet fairways that reach my good summer locations. We will put this in the TBD category for now with a big dash of hopeful in the mix, too. I want to share one shot with you. A short dog leg par 4 at a course I play very often. The dog left is marked by a large tree on the left side of the fairway. Opposite that tree is a bunker. Those two landmarks form the two markers by which I associate all shots on this hole. Flush shot that is pushed right? Over the bunker in the first cut, hope I’m not blocked by the tree. Toe or heeled driver? About even with the tree, hopefully into the fairway enough to have a shot at the green. All this background brings us to a round with the Flash driver after I got home. I hit the ball as low and close to the heel as you can without missing the club. The ball got about 20 yards off the ground. It started at the tree and gently moved about 15 yards right. Once I saw that movement I stopped watching. I went into my default thinking “up by the tree, hope Il have a clear shot at the green.” I walked up the fairway. I got to the area I expected my ball to be. No ball. Keep walking. Keep walking. Keep walking. The ball was in the right 3rd of the fairway, through the dog leg, where I typically find my good drives in the summer. W T F ???? During my most recent lesson there was one thing that stood out to my instructor. No matter where I hit the ball on the face of the club my spin didn’t deviate very much (and I was all over the face). Spin fluctuated between 2700 and 3100 RPM’s. He was kind of shocked and impressed. I don’t know but I think we can chalk that up to the combination of the Flash face and Jailbreak tech. Let’s think about what that tangibly means for golfers. Maybe it means results like I saw on that horrible heel shot I described above. Looks are subjective. I’ve played enough stuff that most everything fits in the fat part of the bell curve and only a small number of things really get my blood moving or really turn me off. The Flash is in that fat part of the bell curve for me. The green and yellow isn’t in my normal sweet spot but I’ve gotten used to it, the majority of that color is on the sole of the driver, and the color combo looks nice on the crown as an accent piece. I was a big fan of the sound and feel of the Rogue. I found the Rogue to have a firm feel off the face at impact and to have a muted sound, no matter what part of the face I used. It was maybe my favorite driver on the sound/feel front. The Flash is different. I’m still trying to figure it out. While on the course at The Hideaway nothing happened that even made me think about sound or feel. It was just squarely in the ‘normal’ range, whatever that means. Then I came home and had a range session. Cold day. Hard golf balls. I was hitting the ball all over the face. Holy hell was this driver loud. For perspective, I previously played the G30. Others thought that driver was loud but I never even noticed it. Since that range session I have spent a decent amount of time trying to figure out sound. Here’s where I am out now. I think the sound is about face impact, that the driver is providing feedback. On center strikes the driver sounds good / great / solid / normal. Think crisp crack. But if I get away from the center, especially high on the face or maybe even high-toe – and especially with a higher compression ball – it is something very different. The description that comes to mind might be hollow aluminum bat. This whole topic is very much in the TBD category, I am still trying to figure it out. But I have made adjustments, such as making sure the ball is not teed up too high, and found better results. And if my early suspicions are correct maybe this is something that appeals to golfers. Feedback is good, it lets us know when we’ve mishit the ball (as opposed to the Rogue where it always sounded the same). 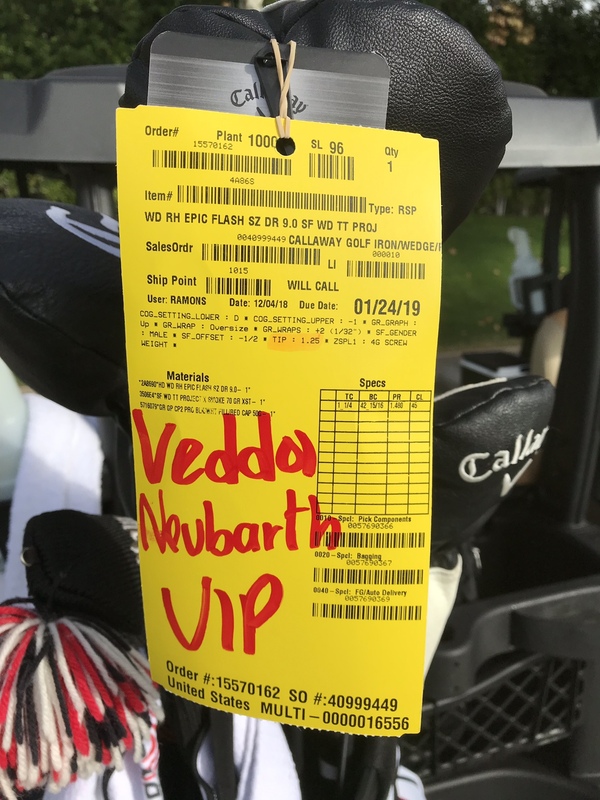 More to come on this as I spend more time on the course with the club…. Last edited by tequila4kapp; 01-04-2019 at 11:04 AM. I swore I was going to keep my OG Epic for 4-5 yrs.... Not happening. More $$ to Callaway from me and I'm not even sad about it. Did they go over at all why they went back to the Epic name? Went from Epic to Rogue and now back to Epic Flash? Just curious if that was discussed at all. Would seem with this new AI tech that maybe they would name it something different, but maybe there's more of a story there. Awesome guys. Great info. Looking forward to more. I am kind of interested in the Smoke shaft and look forward to your reviews of it. To start out I wanted to give you a little feedback on me and my swing in case anyone wants a comparison. I’m 35 years old and 6’1. I tend to have a very flat and short backswing and my swing can become all arms. My typical driver carry is 250-260 with a mid flight and my typical flight is a draw. The Tech: By now everyone is probably aware of Jailbreak and it’s effect on ball speed and forgiveness. Bringing the Callaway woods lineup to the next level is the Flash Face technology which was an extremely impressive piece of technology. 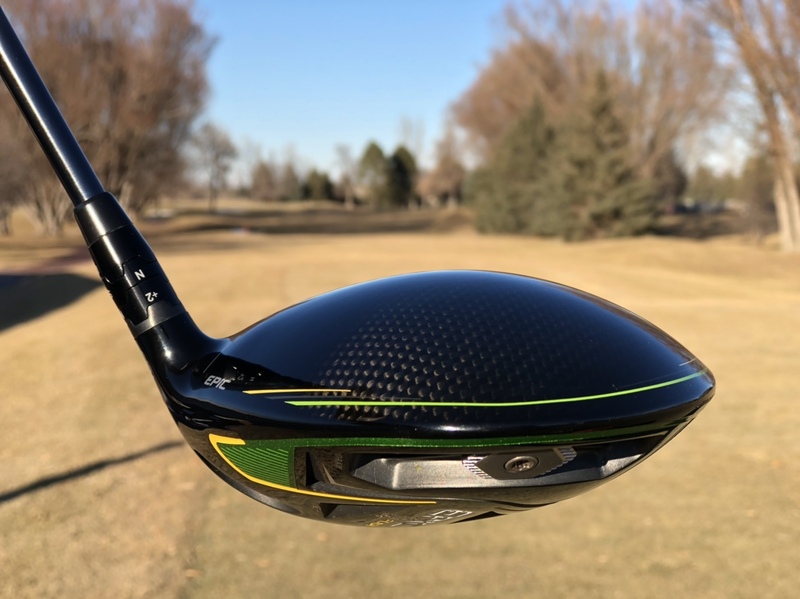 Imagine taking some of the smartest people in the golf industry and combining them with an extremely powerful supercomputer to create a driver/fairway wood face like nothing that has ever been seen. That’s what is going on here. Looking at the back of the face is such an interesting view. The backside of the driver face has traditionally had a support behind the sweet spot in the shape of an X across the face. In the case of this new face the pattern looks like the ripples in a lake when you throw a pebble. This pattern increases ball speeds across the face and offers unbelievable off center performance. Looks: The looks of this driver are bound to create a lot of talk. In my opinion the green is fantastic, I was a huge fan of it in the original Epic. However, when you throw in the yellow accents it can create a love it or hate it look. This color combo is most apparent on the sole but there is also a hint of it toward the back of the crown. At first I was not a fan of this combination but it quickly became an afterthought in my mind. The lines on the crown are something I don’t notice at all anymore and the since I’m not seeing the sole at address that part doesn’t bother me at all. 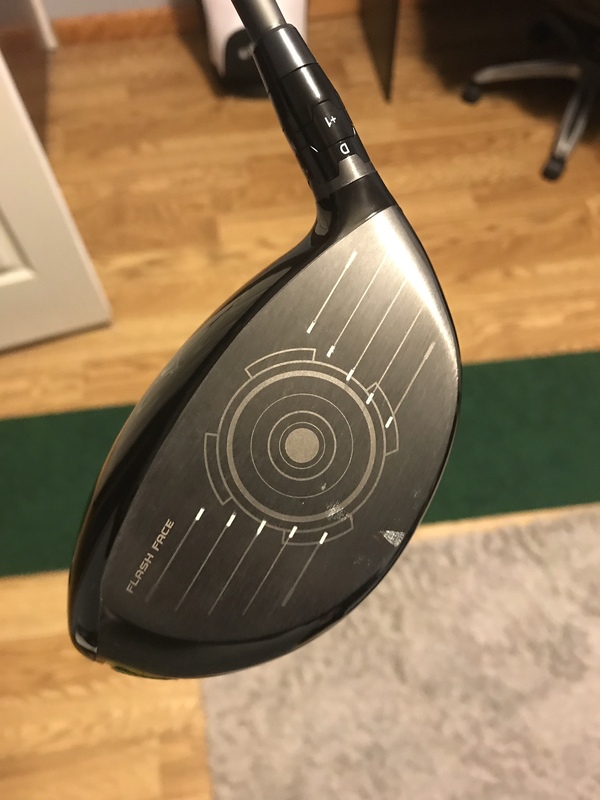 The overall shape of the driver is very pleasing. I am playing the regular version of the Epic Flash and when looking down at address gives a bit more of a stretched look, but nothing like what was seen with the Rogue or other options. 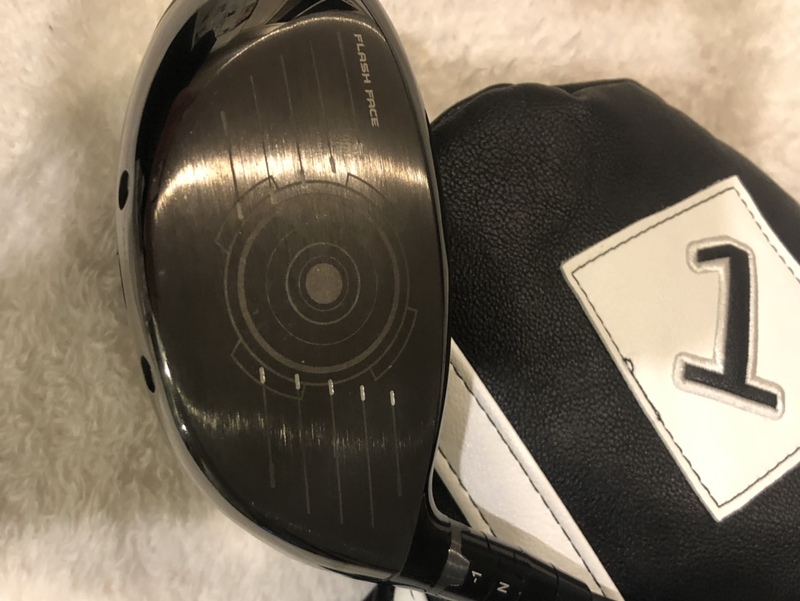 There is the classic Chevron aid toward the front of the crown right behind that you will find a nice thin, gray line that really breaks up the crown and frames the driver face really nicely. This is again something that tends to blend in for me throughout the round unless I’m really focusing on it. Overall the shape is very attractive. I’m very picky when looking down at a driver and once I got used to the color blend it became very comfortable in hand. Sound/Feel: This is the area that always seems to cause a lot of discussion for any brand’s releases and will hold true here. This release is a little louder than what we have been used to previously, but not in a harsh way. I have always been a fan of a muted, carbon sound and even though carbon material makes up a big part of this that is not the audible experience that I noticed. To me this has more of a classic titanium sound to it. It’s not overbearing like some drivers I have tried but it’s a little more noticeable and in my opinion gives a feeling of my shots being more powerful. Speaking of feeling, Oh My Goodness! Flushed drives with this have probably been the most satisfying feeling I’ve ever had with a driver. You can ask both of my cart mates from The Grandaddy, there were a few swings where I just giggled after my drive. It’s almost like a forged iron feeling in a driver and it’s absolutely addicting. Off center hits let you know where you hit it without being harsh. Performance: This is where it’s going to be a longer term review for me since I’m living in the frozen tundra right now but what I saw in California was pretty impressive. Throughout the rest of my bag I was seeing about a club less distance which I’m attributing to elevation differences. However, with the driver I didn’t feel like I was losing any distance at all. In the one round I was able to play back at home it was only about 44* out so I was expecting a pretty significant drop off in distances but much to my surprise I was landing in the normal spots. This has me extremely excited about what summer temps will bring. Forgiveness wise it was really put to the test throughout The Grandaddy. I started out hitting a lot of heel and thin shots which are typically a death blow to any kind of distance. This was certainly the case here as well although it did seem like I lost less distance than normal. When I hit the toe side the ball just seemed to explode, particularly high toe. My missed fairways were typically straight up pulls or pushes but mishits seemed to be quite forgiving, much more so than what I remember experiencing with the original Epic and distance loss was much less than what I’ve experienced with other drivers. 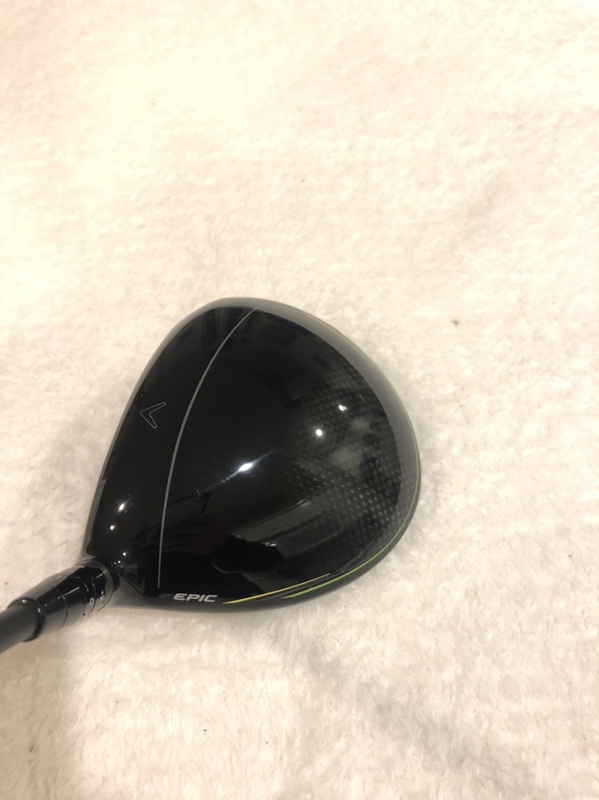 Overall I’m extremely excited about this driver. Last year was the first time in a very long time I didn’t make a driver change. I was absolutely in love with my Ping and my plan was to keep it around to do some head to head testing and keep stored away “just in case”. However after what I saw I came home and put that up for sale about 2 days after. 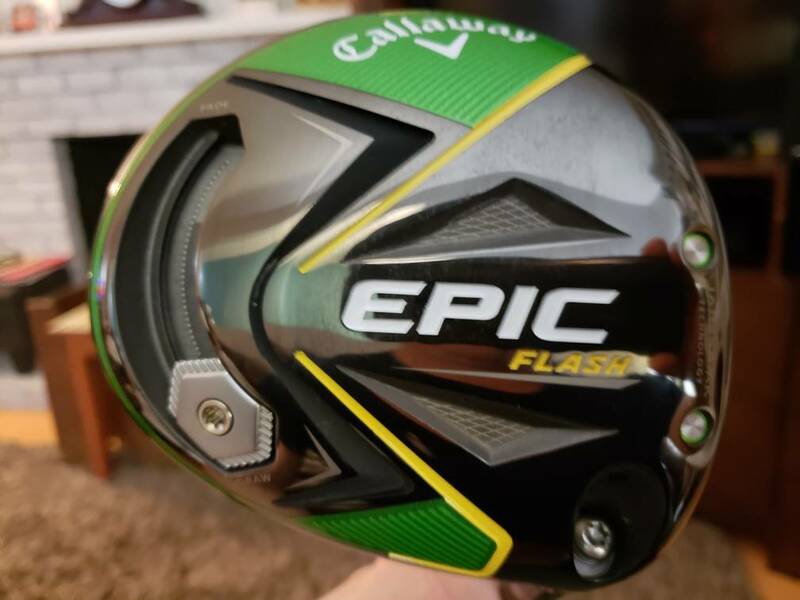 Driver can be a weakness for me but I’m all in on what the Epic Flash can do for my game this year! While it might be semantics, Rogue technically didn't replace Epic. Epic and then to Flash. XR and then to Rogue. One thing to note, which is highlighted in the story on the home page. This is not a small evolution product. This is very outside the box and a crazy tech story. Great work so far guys! The AI part of the tech story is fascinating and the fact that there were literally thousands of iterations of the design, I guess that would make you feel like you got it right...haha! Holy crap amazing stuff so far guys. Sounds like forgiveness is a huge improvement over epic! 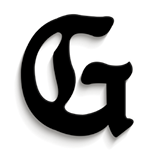 Anyone previously play g400max and have comparisons? Asking for a friend. Very true. And I now remember that being mentioned when Rogue was released. The tech behind this is super interesting. Looks great. It will be fun to see some more comparative numbers. I'm just going to tattoo this on my forearm and show every golfer I see because it'll save time typing it out.